This is Jorge taking our cooler across the river, and PJ waiting for him on the other side. Please take a look at the home video I took of our trip so far (3 months in). I have been alone with PJ in San Pancho for over 2 weeks. 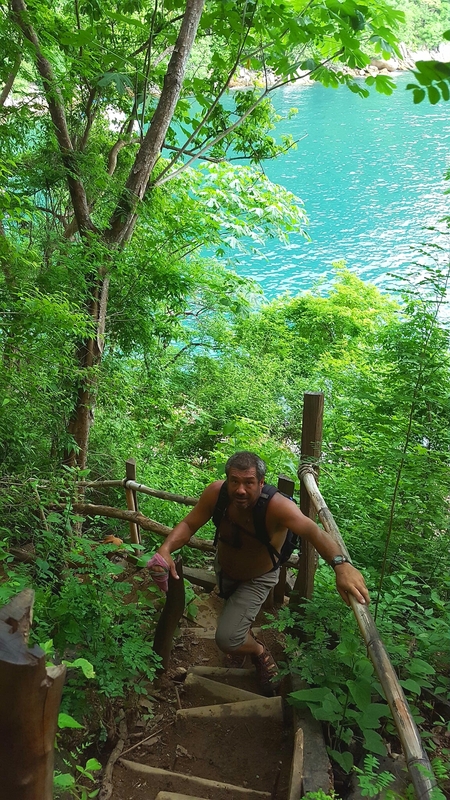 Jorge is in Puerto Vallarta, just an hour away. 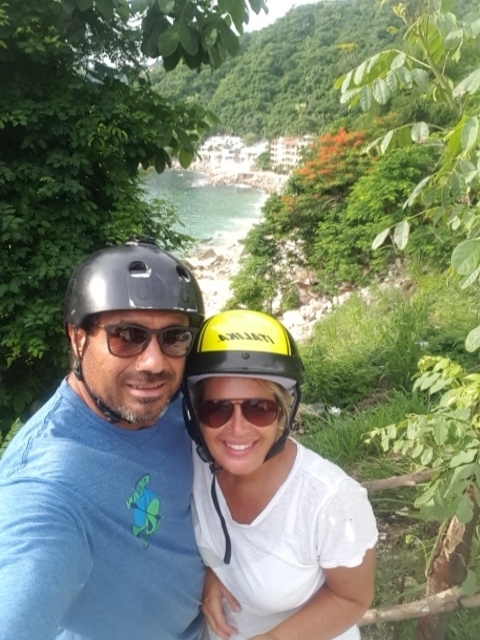 We see each other every few days and do something fun like ride horses or ride our new motorcycle through the jungle to places unknown (to us). 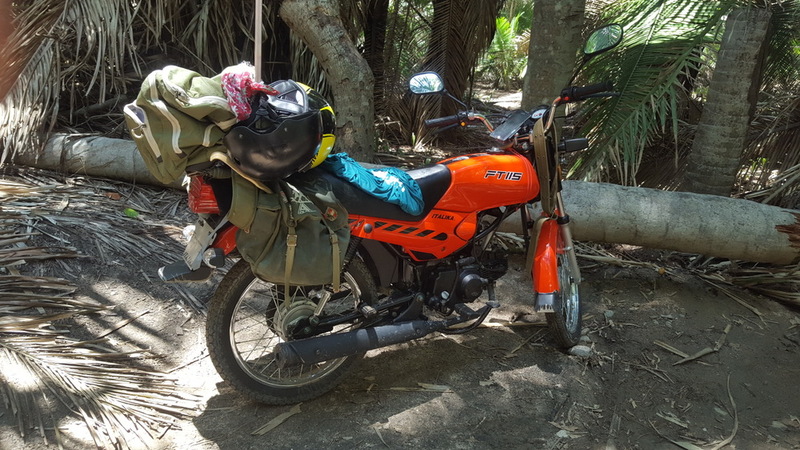 In the last week took the motorcycle to Boca de Tomatlan, and from there hiked to Playa Las Animas. 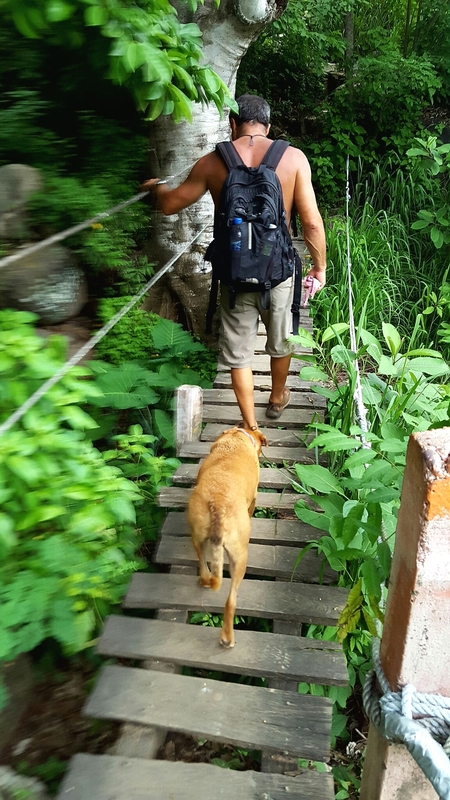 Photos below of Boca and our hike to Playa Las Animas. Photos of horseback riding in Puerto Vallarta, and places we visited nearby. My Spanish is really taking off. Fortunately, I don’t have the opportunity to speak English much in San Pancho. However, I did meet a cute Australian couple who live around the corner who obviously speak English. 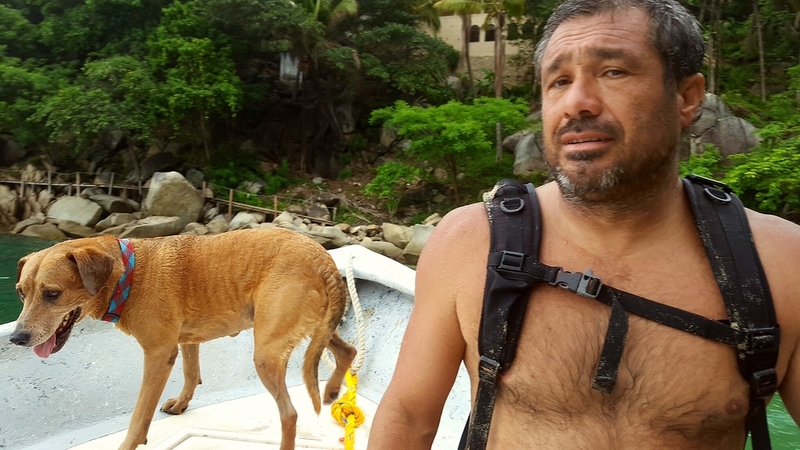 They have a dog that looks like Cesar Millan’s late dog, Daddy. They said they traveled the world for a year, and decided San Pancho was the place they liked best. They are in the process of building a home right around the corner from my apartment. First they built two rental bungalows, and now they are working on their house. I see them most mornings drinking coffee on their balcony overlooking the street. They know everyone in town, including guys passing through on horseback. 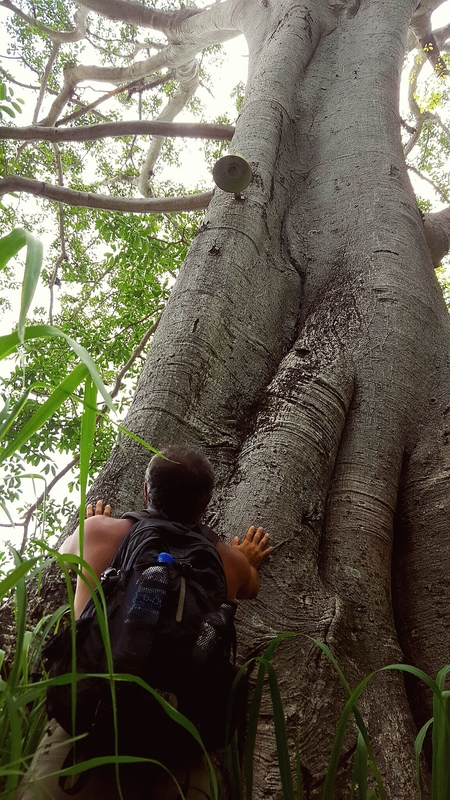 Jorge and I also met a lady who lived in a tree at the beach for 9 years. Seriously. She doesn’t live there anymore, now she runs a little bed and breakfast (surrounded by trees, of course). You meet so many interesting people on the road! San Pancho is such a sweet, special place. You immediately feel the sense of community they have there, and the locals are proud to call it home. I feel grateful to have happened upon it. 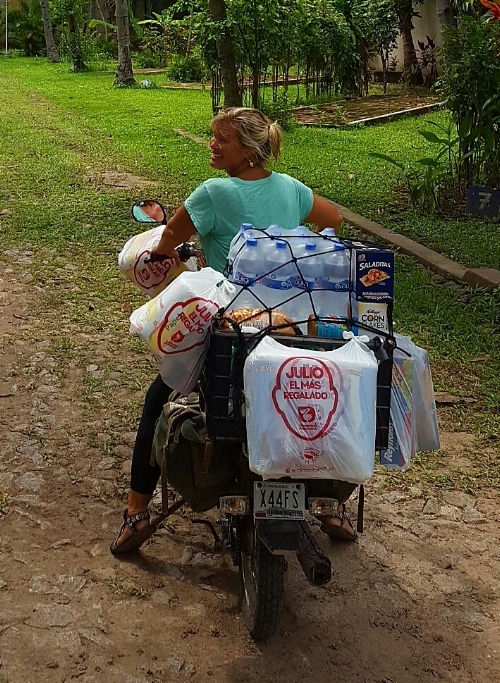 I’ve covered every road and I think all the surrounding jungle roads of San Pancho on foot and on my bike with PJ. I actually set out to do just that, checking Google Earth to make sure I didn't miss anything. I love that many of the cobblestone streets are littered with mangos. Giant, juicy mangos are EVERYWHERE right now. There isn’t a substantial grocery store in San Pancho; however there are several “mini super markets”. I have three mini super markets on my street, and they all carry different things. I get coffee, bread and sugar at one store, fruit, cereal and milk at another store, and drinks and paper towels and yet another store. I don’t buy much food, since I am a terrible cook. There are a few great coffee shops, a fancy French bakery, and several nice restaurants that serve amazing food (and not just Mexican food). There are several food stands set up on the sidewalks, or on the edge of the park, or outside someone’s home. There are two sidewalk stands set up right outside of my apartment, and one restaurant is in the space directly below me. How convenient! I did do some grocery shopping in Puerto Vallarta, where I could get a bunch of stuff at once. The trick was fitting it all on the motorcycle. 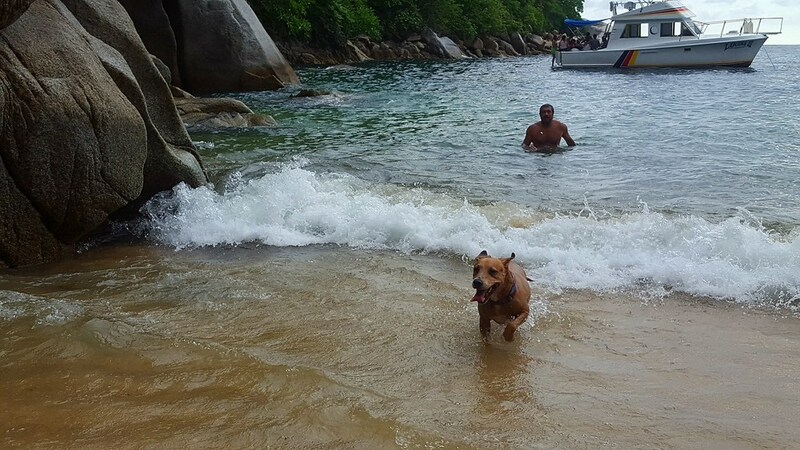 One thing many people love about San Pancho is…the dogs! There are dogs wandering all over town. I think most of the dogs have owners who let them roam freely (people around town have said that). I haven’t come across any vicious dogs, just the opposite. PJ has been known to fight larger dogs now and then, but he hasn’t been aggressive with any dog here (THANK GOD). I feel comfortable enough to walk with him off leash everywhere. I recently taught him to wait for me outside of stores that I enter, although most store owners would welcome him in (including restaurants and grocery stores). He just sits in the middle of the doorway (blocking people coming in and out) patiently waiting for me to return. Since I’ve been here I have gotten to know several dogs that I see every day. My favorite is a big, fat, chocolate lab with light eyes that hangs out at the beach. 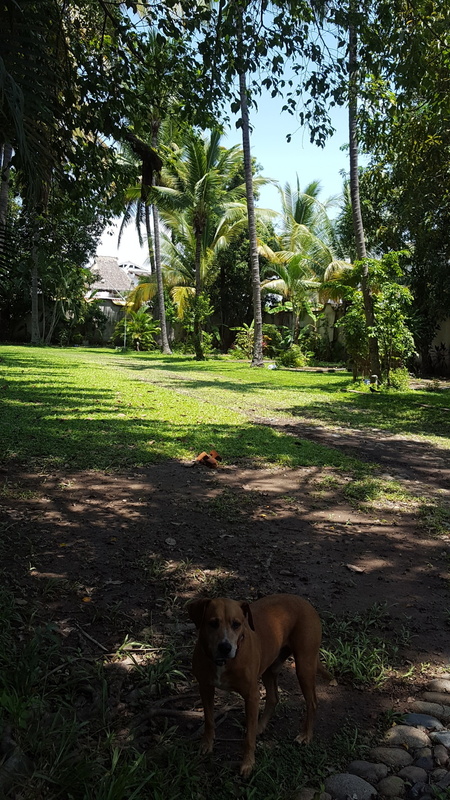 He takes in shade and naps under the palapa restaurant in the sand, and then makes his rounds on the beach throughout the day. People give him lots of love, but I think I’m his current favorite because I actually bought him his own order of french fries the other day. He gobbled them up in the blink of an eye. He wears a collar and I don’t see him after the sunset. Speaking of the sunset, it is somewhat of a nightly celebration in San Pancho. People gather every night on the sand to see the sun go down. It’s sort of like a free summer concert at the park. PJ and I go almost every evening. We get there by 8:15 pm, and the sun disappears about 8:50 pm. Sometimes if it’s really amazing people applaud as the sun disappears below the ocean. 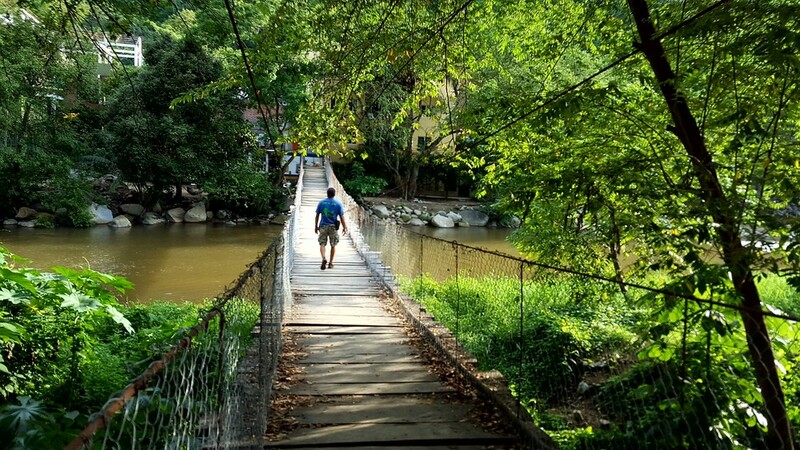 It’s just a heartwarming, feel-good thing to do in San Pancho. Take a look at my sunset photos below. The one of the girl standing alone is actually me. Just kidding. After dark the beach lights up with the glowing basket lights that hang in the trees. 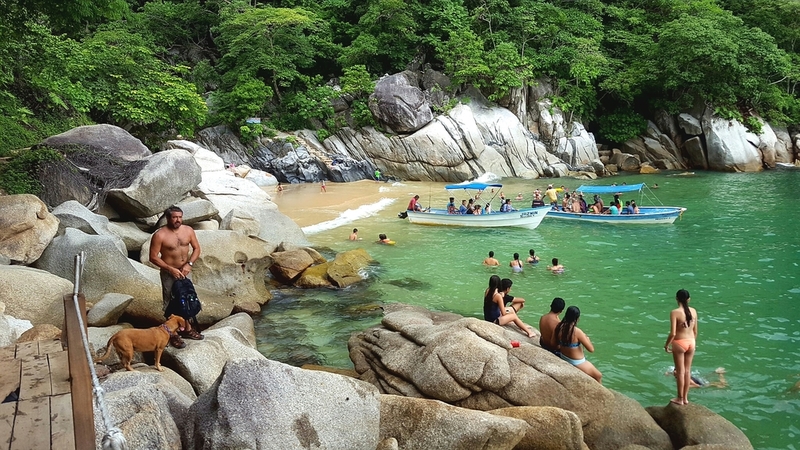 People hang out in the outdoor restaurants, and gather in groups in the sand and just enjoy the good vibes of San Pancho. On another note, there is some great shopping in San Pancho, although it’s limited since it’s a small village. Lots of artsy, high quality, original stuff. There are a couple surf shops. A couple weeks ago in Lo de Marcos we traded one of our kayaks for a paddle board. We are having Lotus Surf Shop re-surface it and change the fin. Looking forward to trying it out soon. That leads me back to the subject of San Pancho beach. 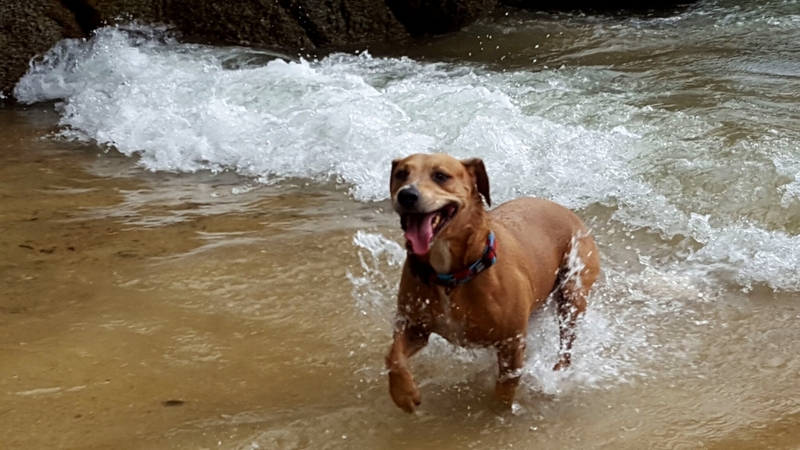 I should have mentioned that the waves intimidate many people, but it is actually a great swimming beach if you know how to time your entry into the ocean. San Pancho is a fairly long beach. Most people gather right in the middle of the beach where the main street ends. The two opposite ends of the beach are almost always deserted. So if you like to be alone you can have a big wide beach all to yourself on either end. Anyway, in the center where everyone gathers, the waves don’t break until they get to shore. If you watch the ocean swells and sneak in between the big breakers, you can place yourself in the heavenly sweet spot. It’s really a pleasure to just float in that special spot before the break and let the ocean pull you way up (and I mean WAY up) to the top like an elevator, and then you roll over the top of the swell and you float smoothly back down. As you float over the top of the wave you see the wave curl and break onto the sand. Anyone in front of it just disappears in the white wash. That can be entertaining as well. Believe it or not, PJ has got the timing thing down and is really good at entering the ocean with big waves. I just came naturally to him, I mean, how could I teach a dog how to do that? It’s really incredible to watch, and several people who have watched him have remarked at how amazing he is in the waves. Many people take photos and video of him. He’ll stand and watch the water, and then when there is a break between swells he enters quickly and swims out to the exact right spot before the break. Then he just hangs out with me and we roll with the ocean for a while. The funny part is that when we are out there floating he likes to swim in circles around me. Just what he does. Almost daily I watch an old raggedy panga (outboard motor boat) speed around the bay from the north and head toward San Pancho beach. There are usually three guys on board. They slow down as they get closer, and then put their engine in neutral about 40 feet from shore. They lift up a big white cooler that has straps around it, and dump it into the ocean and then take off. Shortly after the drop off a couple guys from shore and go into the ocean to retrieve it. I’m assuming it’s fish for the restaurants, since the guys retrieving it drag it there(and because they aren’t dropping it secretly in the middle of the night, if you know what I mean). As I mentioned, Jorge is staying at Puerto Vallarta Trailer Park (RV Park). As usual for this time of year, he has the entire park to himself. 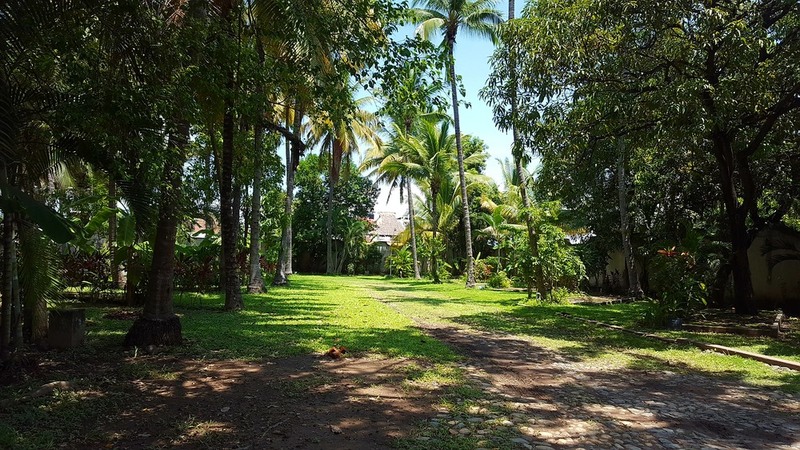 We liked this place because it is close to the beach, fully enclosed by a tall brick fence making it feel very private, and the lush garden oasis atmosphere. It’s quite large, and has cobblestone roadways, and nice restroom facilities. The owner has his house on the property, and actually has an open lounge area where his guests are welcome. The area has couches, a huge table with chairs, bathrooms and an open kitchen. Jorge paid $17 per night. Below are a couple photos of the place. Our tentative plan for the next leg of the trip is to drive inland to Guadalajara, and then continue across to the Gulf of Mexico. From there we will finally hit the Yucatan! Thanks so much for reading my blog! PJ has to be involved with everything.